The NH Young Farmers are grateful to all the farms who participated in August's Harvest for All donation. 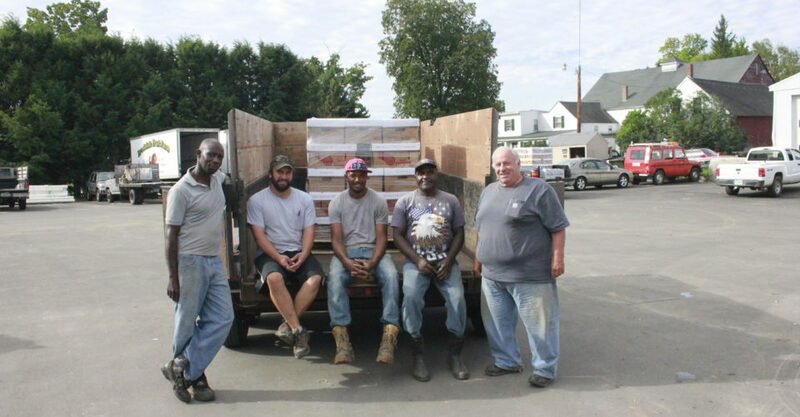 Chip Hardy (far right) and the crew at Brookdale Fruit Farm poses here alongside their donation of 3 pallets of tomatoes! Jackie Johnson and Justin Roberts, Granite State FFA State Officers, helped collect produce from the seacoast region to contribute towards the 7,855 total pounds of food donated on August 15th. Young Farmers unload fresh produce at the NH Food Bank in Manchester. WMUR was there to capture one of the many truckloads of fruits and veggies brought in that day. Young Farmer Committee Chair Amy Matarozzo (left) and Vice-Chair Christina Murdock could not be happier seeing the generosity of local farms contributing to the Harvest for All program. Theo Mongeau (right) and NH Food Bank staff work to unload donations at the NH Food Bank in Manchester. 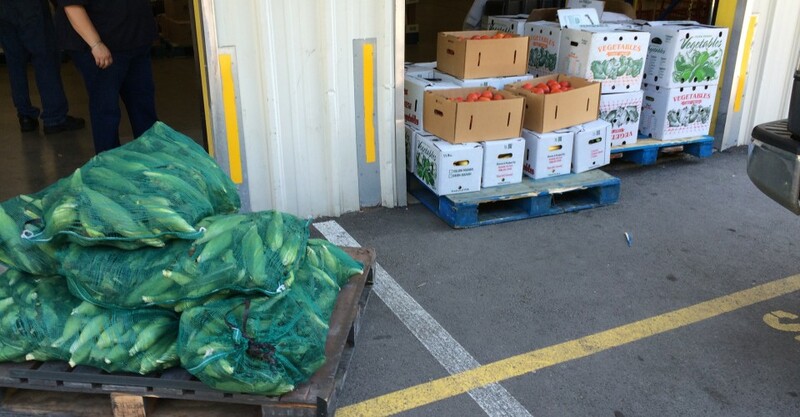 Concord, NH – Over 7,800 pounds of fruits and vegetables were donated to the Friendly Kitchen in Concord and the NH Food Bank in Manchester thanks to volunteers from the New Hampshire Farm Bureau Federation Young Farmers Committee and the generosity of local farms. 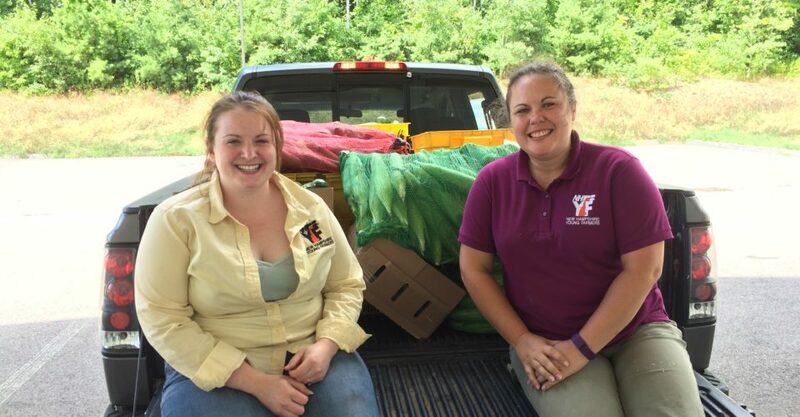 The Young Farmers, with some help from two Granite State FFA Officers, spent Monday August 15th travelling across the state visiting 11 farms to pick up produce donations for the Harvest for All program. This entry was posted in Press Release and tagged agriculture, Agriculture in NH, Community Service, Donations, Farm Bureau, Farm Bureau Proud, farms, Harvest for All, NH agriculture, NH Farms, NH Food Bank, NH Young Farmers, Young Farmers on August 16, 2016 by Josh Marshall - NHFBF Communications Director. This entry was posted in Blog and tagged agriculture, Agriculture in New Hampshire, Farm Bureau, farm labor, farms, H-2A, labor on July 21, 2016 by Josh Marshall - NHFBF Communications Director. 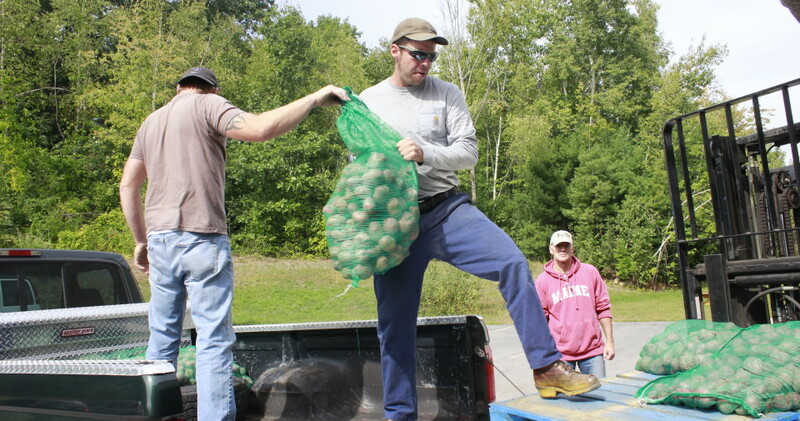 Young Farmer member Theodore Mongeau unloads potatoes at the New Hampshire Food Bank on September 25th during the second round of produce collection for the Harvest For All campaign. NHFBF Young Farmers collected and donated 3,172 pounds of produce that day bringing their total donation to 5,000 pounds for the year. 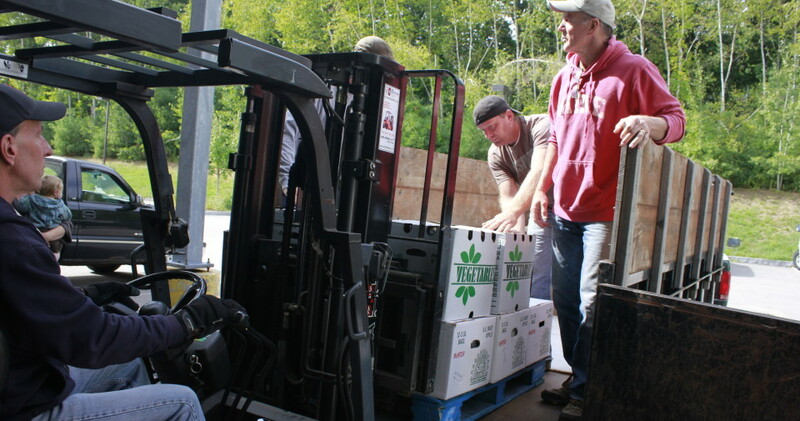 Employees of the New Hampshire Food Bank in Manchester load pallets with fresh produce donated by 8 New Hampshire farms and collected by the NHFBF Young Farmers. A bin full of corn, peppers, beans, and blue hubbard squash is just part of the 3,172 pounds of fresh produce donated by New Hampshire farmers to the New Hampshire Food Bank on September 25th. The NHFBF Young Farmers organized and collected the donation adding to their previous August donation of 1,900 pounds for a total of over 5,000 pounds. Manchester, NH – With the completion of their second round of collections on September 25th, The New Hampshire Farm Bureau Young Farmers have now organized the collection and donation of over 5,000 pounds of fresh produce from New Hampshire farms to the New Hampshire Food Bank in Manchester and The Friendly Kitchen in Concord. September’s collection alone brought in 3,172 pounds of fruits and vegetables to the New Hampshire Food Bank. Combined with a collection in August of just over 1,900 pounds, New Hampshire farms have, in the last two months, provided over 4,200 meals to hungry New Hampshire residents according to Nancy Mellitt, New Hampshire Food Bank’s Director of Development. This goes a long way towards supporting the one in nine individuals who are statistically food insecure in our state. For both collections, New Hampshire Farm Bureau Young Farmer members and coordinators spent the day travelling to area farms picking up donations and transporting them to their destination. Young Farmer Co-chairs Amy Matarozzo and Valerie Drown and Young Farmer member Theodore Mongeau volunteered their time and transportation resources to make it all possible. 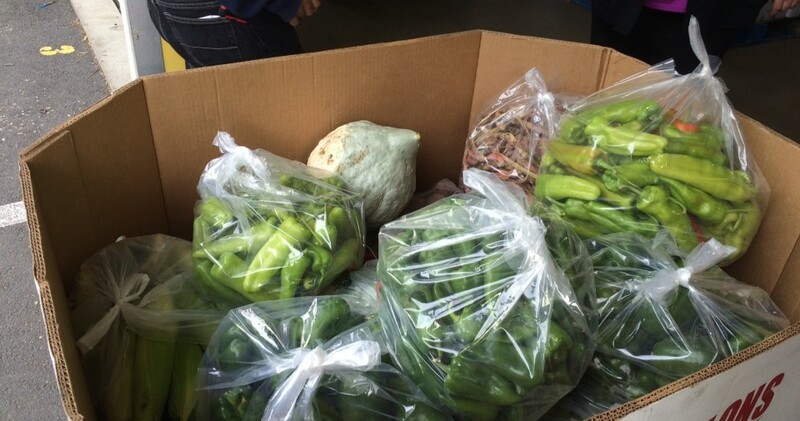 Ten farms contributed to this year’s donations by giving a wide range of produce including tomatoes, cabbage, apples, zucchini, peppers, corn, and winter squash. Autumn View Farm in Pittsfield, LaValley Farms in Hooksett, J+F Farms in Derry, Wilson Farms in Litchfield, Normanton Farm in Litchfield, Brookdale Fruit Farm in Hollis, Marshall Pumpkin Farm in Boscawen, Apple Hill Farm in Concord, Carter Hill Orchard in Concord, and Sunnycrest Farm in Londonderry all were glad to donate to such a worthy cause. The New Hampshire Farm Bureau Young Farmers have been collecting donations in conjunction with the Harvest For All campaign, a partnership with the American Farm Bureau Young Farmers & Ranchers Program and Feeding America, a nationwide network of food banks, for over 5 years. They are currently raising a beef cow that will be donated for next year’s Harvest For All campaign. To make donations towards the Harvest For All campaign visit www.nhfarmbureau.org and look for Harvest For All under the Young Farmer tab under Membership or contact Josh Marshall at editor@nhfarmbureau.org or call 224-1934. This entry was posted in Press Release and tagged Donating food, Farm Bureau, farms, Feeding America, Food Bank, Fresh produce, Harvest for All, New Hampshire Agriculture, NH Farm Bureau, NH Farms, NH Young Farmers, Young Farmers on October 6, 2015 by Josh Marshall - NHFBF Communications Director. The first load of just over 1,900 pounds of fresh produce donated from six NH farms sits on pallets at the New Hampshire Food Bank in Manchester. Corn, cucumbers, green beans, tomatoes, green peppers, and cabbage are just some of the vegetables that will go to help feed the hungry in NH. 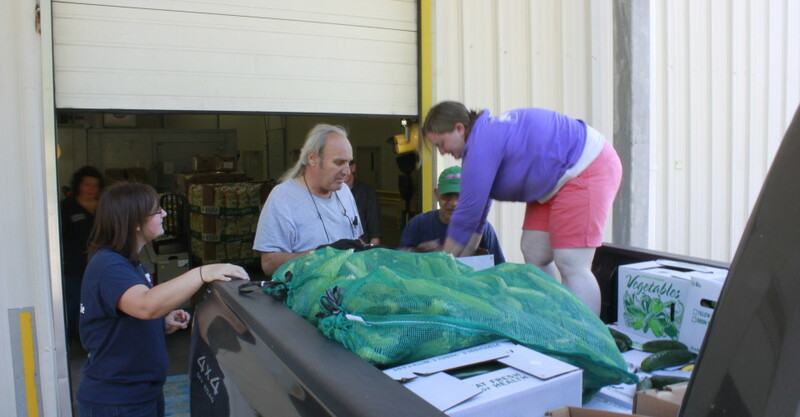 Young Farmer Co-Chair Amy Gowell Drogue (right), Co-Coordinator Leandra Pritchard (left), and workers from the New Hampshire Food Bank unload fresh vegetables donated by six NH farms. NH Young Farmers are working in partnership with the Harvest For All Campaign to feed the hungry. 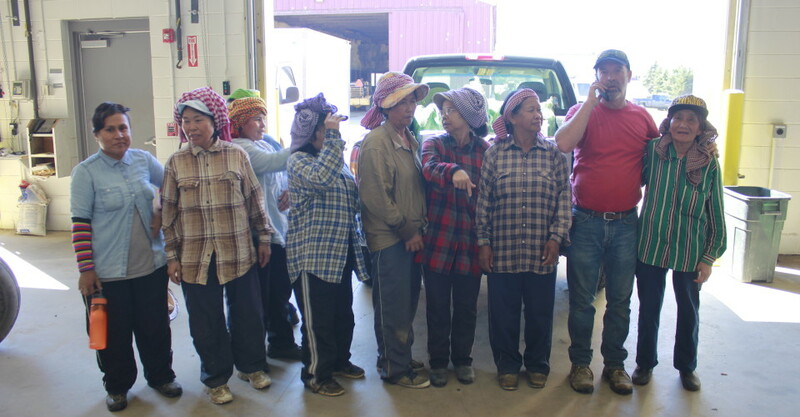 Farm Manager Keith Marshall and the hardworking ladies at Wilson Farm in Litchfield stand in front of their donation for Harvest For All. 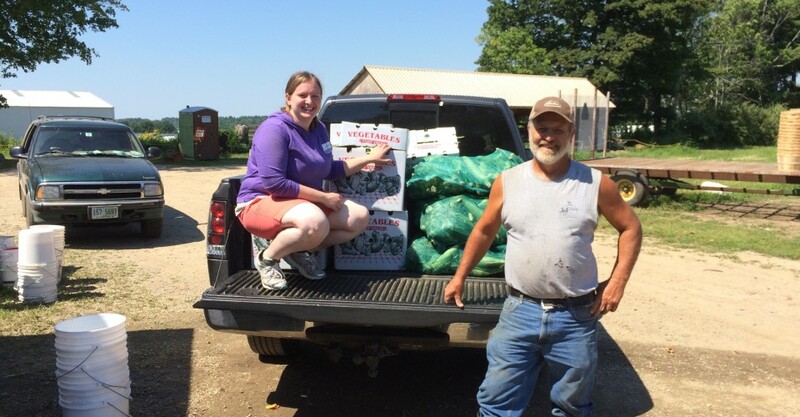 Rockingham County Farm Bureau President Phil Ferdinando of J & F Farms in Derry and Young Farmer Co-Chair Amy Gowell Drogue finished loading fresh vegetables for the Harvest For All Campaign. Through the Harvest For All campaign, a partnership with American Farm Bureau’s Young Farmers and Ranchers Program and Feeding America, a nationwide network of food banks, New Hampshire Farm Bureau Young Farmers organized and collected the donation of over 1,900 pounds of fresh produce from six New Hampshire farms on Monday, August 3rd. NHFBF Young Farmer Co-Chair Amy Gowell Drogue and Co-Coordinators Leandra Pritchard and Josh Marshall picked up fresh vegetables from Autumn View Farm in Pittsfield, Lavalley Farm in Hooksett, J & F Farm in Derry, Wilson Farm and Steve Normanton Farm in Litchfield, and Brookdale Fruit Farm in Hollis delivering the donations to the New Hampshire Food Bank in Manchester and the Friendly Kitchen in Concord. This entry was posted in Press Release and tagged Donating food, Farm Bureau, farms, Feeding America, Food Bank, Fresh produce, Harvest for All, New Hampshire Agriculture, NH Farm Bureau, NH Farms, Young Farmers on August 5, 2015 by Josh Marshall - NHFBF Communications Director. This entry was posted in Press Release and tagged Farm Bureau, farms, NH agriculture, NH farm, USDA poultry processor on January 13, 2015 by Maureen Duffy - NHFBF Communications Director. This entry was posted in Press Release and tagged agriculture, Farm Bureau, farmers, farms, New Hampshire, NH agriculture, NH farm, NH Young Farmers on January 9, 2015 by Maureen Duffy - NHFBF Communications Director. This entry was posted in Press Release and tagged agriculture, chicken, farms, locally raised chicken, New Hampshire, NH agriculture, poultry, USDA poultry processor on December 18, 2014 by Maureen Duffy - NHFBF Communications Director. 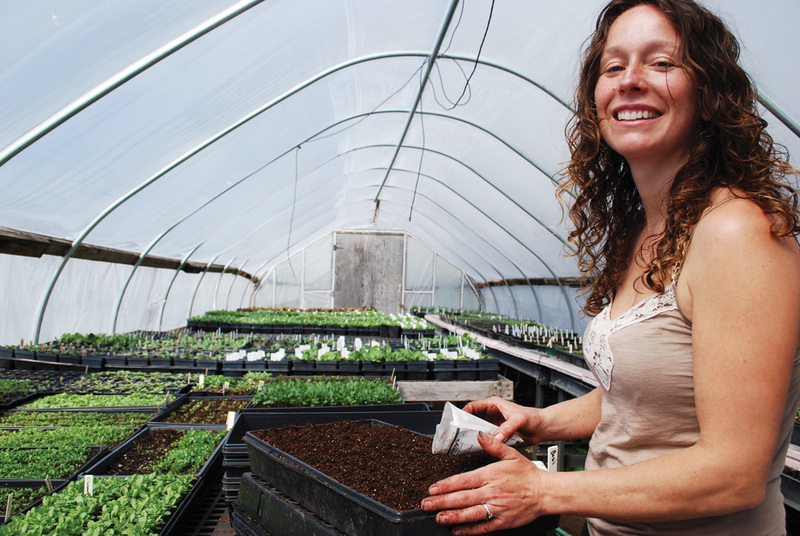 Tracie Smith of Fitzwilliam is one of the 1,358 principal women farm operators in the Granite State. This entry was posted in Press Release and tagged agriculture, farms, New Hampshire, NH agriculture, women in agriculture on May 12, 2014 by Maureen Duffy - NHFBF Communications Director. 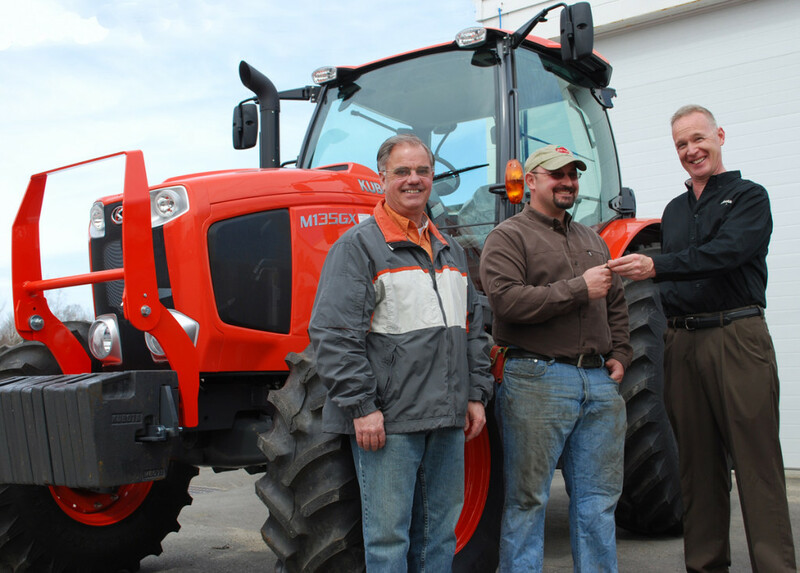 Kubota Regional Sales Manager for New England Larry Curran (right) hands the tractor keys to the 2013 Young Farmer Achievement Award winner Trevor Hardy (center) with Mike Snide (left) of Pinnacleview Equipment in Walpole. Special thanks to Pinnacleview Equipment and Kubota for their continued support to the New Hampshire Young Farmer program. This entry was posted in Press Release and tagged agriculture, farms, New Hampshire, NH agriculture, NH Young Farmers on April 11, 2014 by Maureen Duffy - NHFBF Communications Director. Legislative Assistant Emily Lynch (center) listens to the N.H. Young Farmers during their visit to Senator Ayotte’s office. This entry was posted in Press Release and tagged agriculture, farms, New Hampshire, NH agriculture, NH Young Farmers on April 8, 2014 by Maureen Duffy - NHFBF Communications Director. We are very fortunate to live in a country where food is abundant and affordable. In recognition of our agriculture industry, March 25 has been set aside as the date to celebrate National Ag Day. This entry was posted in Press Release and tagged Ag Day, agriculture, farms, New Hampshire on March 24, 2014 by Maureen Duffy - NHFBF Communications Director. New Hampshire Farm Bureau Federation (NHFBF) honored Chuck and Diane Souther of Concord with the Profile Award for outstanding service to New Hampshire agriculture and rural life. The 72nd consecutive Profile Award was presented at the NHFBF annual meeting banquet on November 8 at Huddleston Hall, University of New Hampshire, Durham. 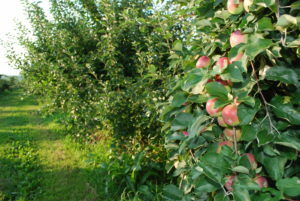 This entry was posted in Press Release and tagged agriculture, farms, New Hampshire, NH agriculture on June 7, 2013 by farmgirl403.